Explanation: A bizarre stellar corpse 19,000 light-years from Earth, pulsar PSR B1509-58 beckons from the small southern constellation of Circinus. Like its cousin at the heart of the Crab nebula, the Circinus pulsar is a rapidly spinning, magnetized neutron star. 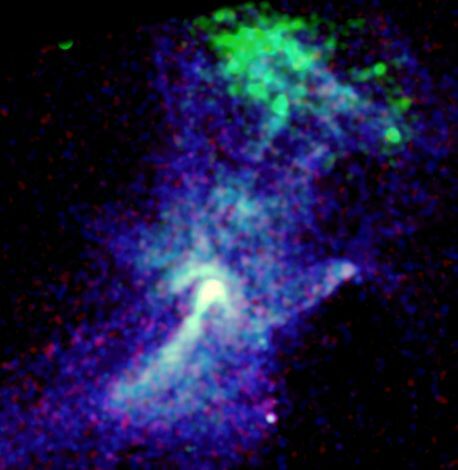 Seen in this false-color Chandra Observatory image, the environment surrounding this cosmic powerhouse glows in high energy x-rays. 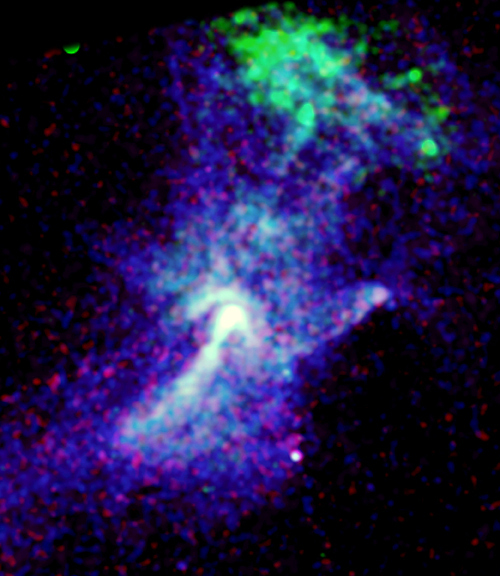 The Circinus pulsar itself, thought to generate more than 7 quadrillion volts (7 followed by 15 zeros), lies within the knot of bright emission near the center of the picture. Stretching toward the bottom left, x-ray emission traces a jet of particles almost 20 light-years long that seems to arise from the pulsar's south pole, while the arc of bright emission above the central knot is likely a shockwave produced by particles driven from the pulsar's equator. Near the top of the picture, lower energy x-ray emission shown in green is from gas shock-heated to millions of degrees Celsius. The shocked gas was produced by debris blasted out from the stellar explosion that created the Circinus pulsar.